Just Look At This 1/48th Creation! Now for something that should make you smile and equally amaze you....... a good friend who just happens to be a very talented miniature doll maker, popped around the other day for a coffee and good old natter, then casually placed in my hand her latest creation which has taken months to perfect. I was looking at the teeniest “old lady” that I have ever laid eyes on..... fully manipulative....her arms and legs bend plus she can even sit!!! Yes folks....this is the very first 1/48th scale doll made by Robin Britton of Coombe Crafts and it's simply fabulous! There are furniture sets to accompany the little doll in the same scale too (as seen in photo below). PS. For those of you who are fans of the 1930s/1940s ....Robin makes superb WW2 characters such as RAF chaps, soldiers and her infamous Fag Ash Lil! Do check out her website if you can. 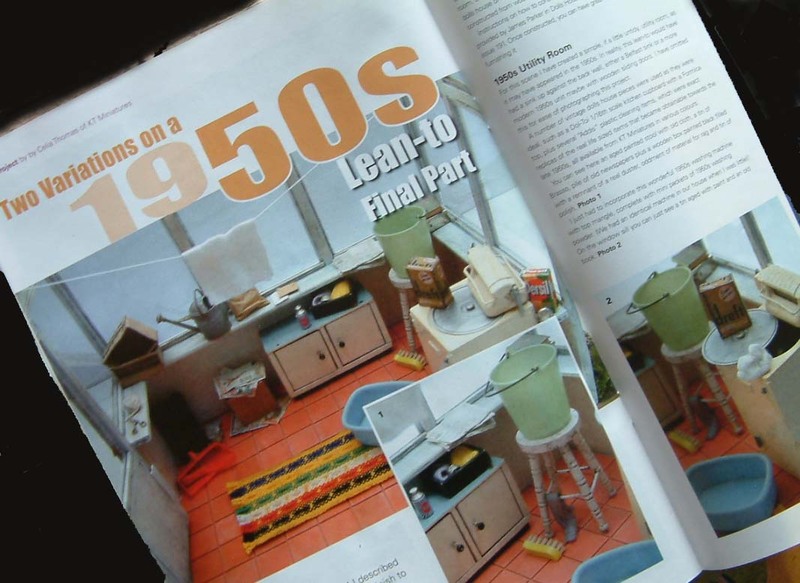 The final part of KT Miniatures' 1950's Lean-to article can now be found in the current issue of Dolls House & Miniatures Scene magazine (September No. 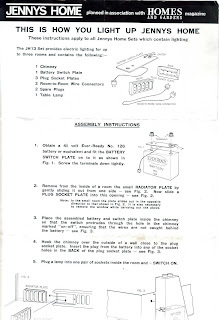 195). Part One of this project was featured in last month's issue that showed how to decorate James Parker's lean-to from an earlier magazine project.In this final part you can read how the lean-to was staged both as a 1950's utility room, then as a 1950's back porch. Was great fun to do! 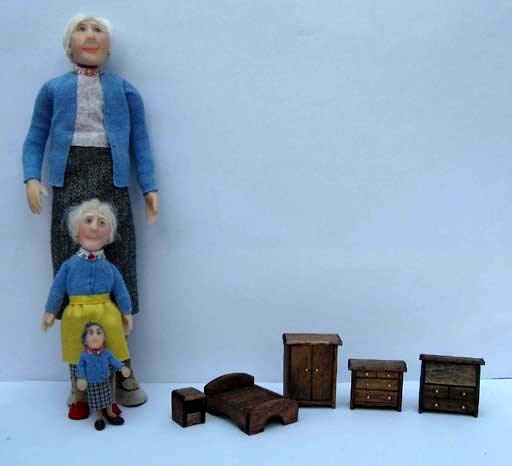 Being a child in the ‘60s, I grew up with a few pieces of Tri-ang furniture in my handmade dolls house and I love everything about the entire range. Each piece of furniture and accessory was modelled on real life pieces and the detail is just wonderful. 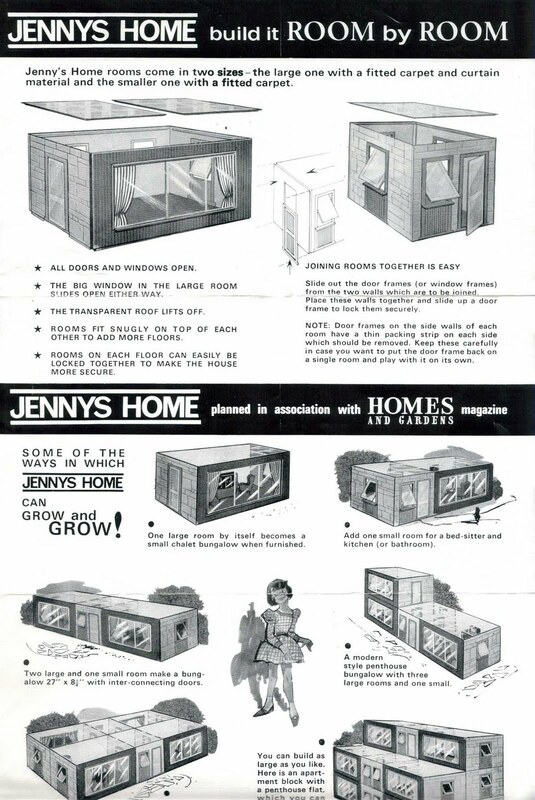 In its day, compared to the majority of other dolls house furniture available at that time, Tri-ang furniture was more expensive and generally out of my ordinary pocket money range! 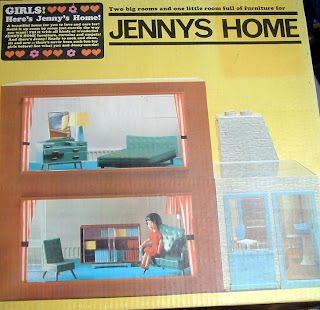 A whole new set of Tri-ang furniture and accessories have arrived in from two different sources, including some magnificent boxed sets of Jennys Home. (Amongst pieces that have just been listed on KT Miniatures website are the elusive metal ascot boiler, see-saw, filing cabinet and lots of other superb pieces)! 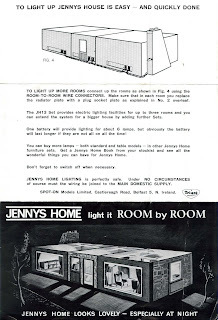 There are also several Jennys Rooms including a boxed JR105 set which has been listed under the Dolls House For Sale section. That particular set consists of three rooms and original furniture, in a good played with condition. 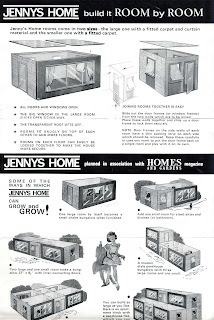 There are also a couple of leaflets accompanying that particular set so I have scanned them and reproduced them below for all of you who have these wonderful Jennys Rooms but may not have seen the leaflets before. They make interesting reading. 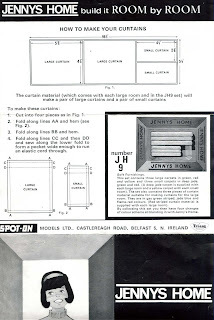 The first leaflet is a general one but is fascinating as it shows here the diverse combinations that can be obtained by using various numbers of these rooms. 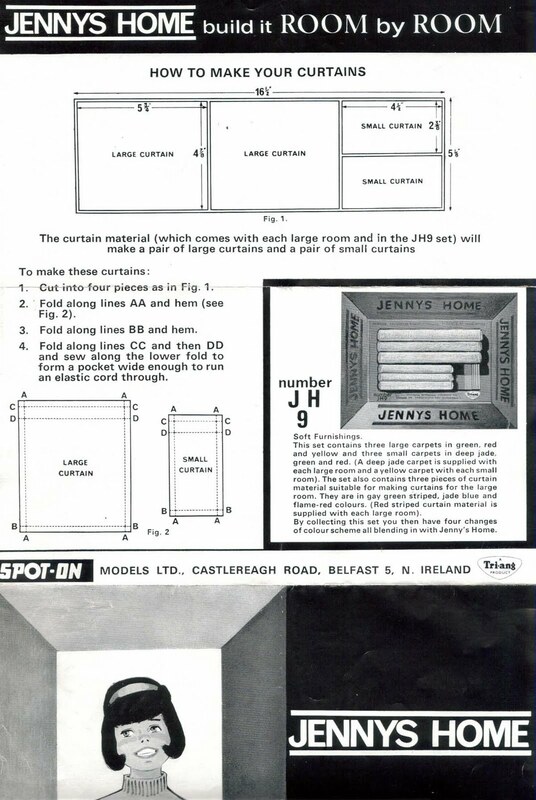 On the reverse of this leaflet are instructions for making up the curtains with the striped material that was supplied with the room boxes. 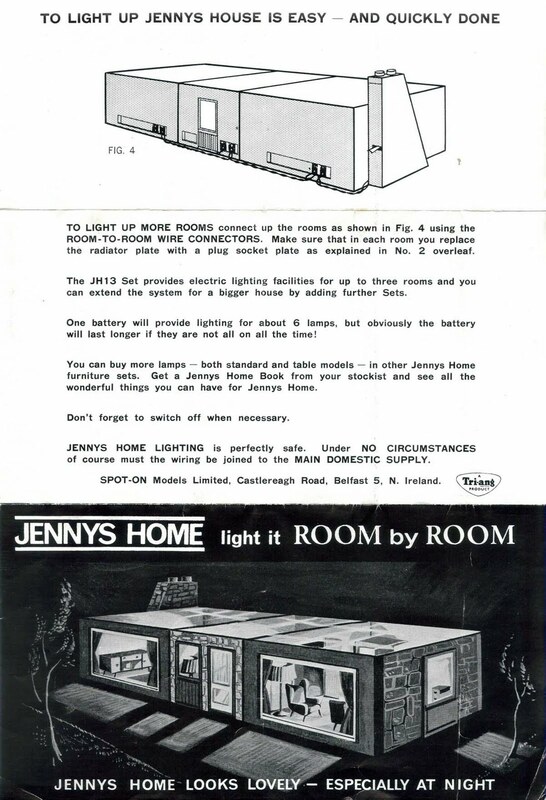 This second leaflet shows how one used to be able to light up the Jennys Home. 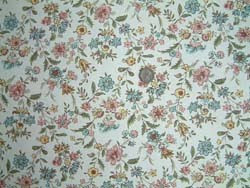 At last, more fabulous genuine antique wallpaper from the States has arrived in and have just been added to KT Miniatures website. These additional 12 designs range from early 1900's to 1940's and are now available to buy. 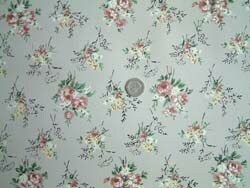 These papers are suitable for antique & vintage dolls houses and a fantastic solution to your mini decorating, if your old dolls house does not retain any original decoration. Designs range from both bold and exquisitely dainty floral to geometric and stripes. 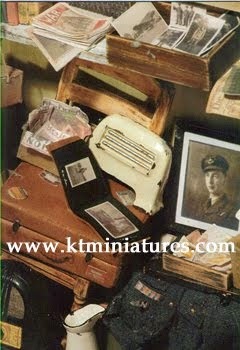 Followers to KT Miniatures website will notice that the wallpaper in this new batch is more expensive than any previous papers, however due to increased costs from supplier, currency fluctuations, postal costs and finally customs/excise costs these increases were inevitable. 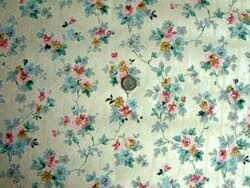 Please note that any wallpaper ordered will be despatched in a long postal tube/box. 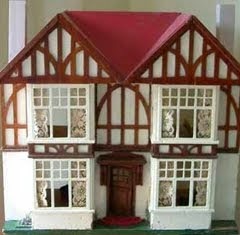 Each pattern will be sold by the metre which should be adequate for a normal sized 1/12th scale dolls house. However if you wish to purchase more than a metre of a specific pattern, please contact me before ordering, as several of the patterns are not full rolls and are limited. I strongly recommend that you use ordinary household wallpaper paste to fix then handle like any normal wallpaper, smoothing out air bubbles from the centre, outwards (although, it is extremely fragile and needs to be handled very carefully otherwise it will tear easily). But it is well worth the perserverance and am sure you will be pleased with the results! Using antique wallpaper to decorate your antique and vintage dolls houses can enhance and even add value to your old treasure. 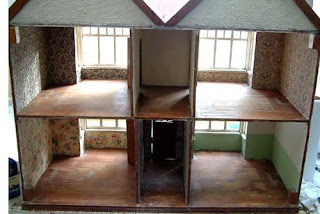 I have used it here in my old favourite 1930s Hobbies dolls house......personally I was chuffed to bits with the result. Some Wartime Miniature Creations From Linda Larsen, Australia! Every so often, I am privileged to have customers who email me through images of their wonderful creations based on the 1930s-50s eras. Well not long ago Linda Larsen, a customer from Australia, told me about some of her wartime creations and subsequently has agreed for me to put them up in KT Miniatures Customer Creation Gallery. The images are quite unique and breathtaking and if you are a fan of the WW2 era, you will love them! To give you a hint of what you can see on Linda’s KT Miniatures Customer Creation Gallery page, just take a look at the following! Linda is a fan of Greenleaf kits and has made a fantastic WWII Bomb Shelter out of a Greenleaf Loganberyy Kit.....but if that was not enough, she also included a British Resistance Hideout underneath the shelter....fabulous! From another Greenleaf kit, Linda has made a wartime shop – again her unique style has made this into something fabulous! 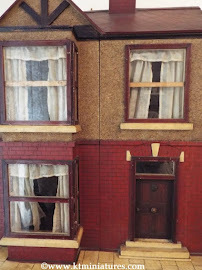 Another of Linda's creations include a Wartime Terrace House too. 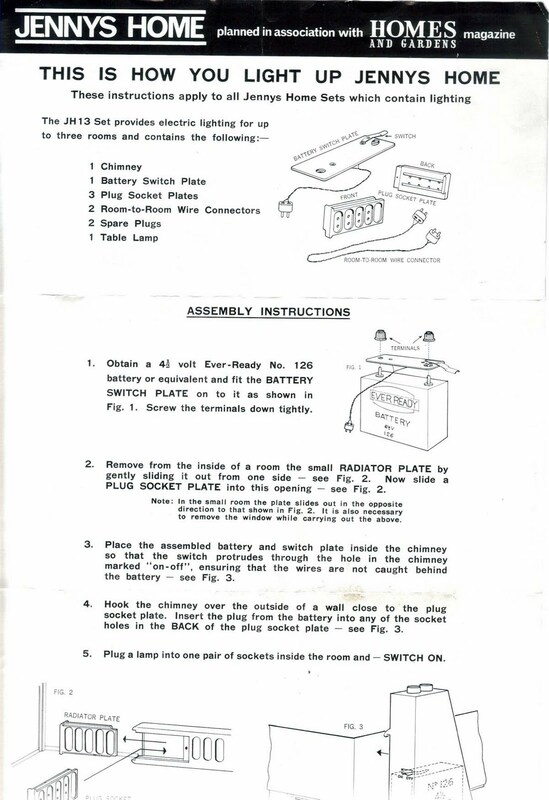 The image above is the kitchen in the wartime house. 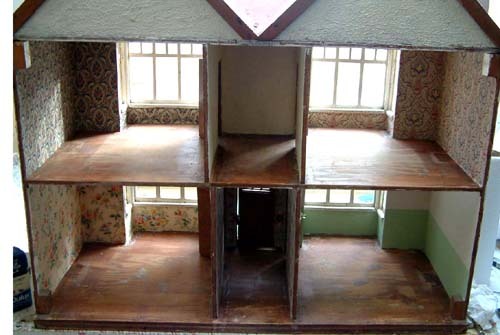 Radio 4 Dolls House Programme - Did you miss it? I have just heard from Sarah Taylor, Senior Producer for BBC Radio, that “The Doll’s House” programme will be broadcast on Radio 4 Thursday 8th July @ 11.30am. (Overseas readers, please note that the time quoted is British Summer Time). 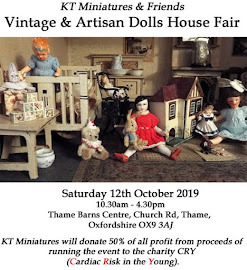 Visitors to Thame Dolls House & Miniatures Fair back in February may have seen Sarah walking around the event with her microphone interviewing artisans and members of the public. She tells me that it has been really hard for her to edit over 11 hours of material taken on various locations to fit into just half hour allocated for the programme. Sarah also says that the Radio Times have chosen the programme as “Choice Of The Day”. Sounds well worth listening to and I for one will definitely be tuning in!